Please Note: The Spectralink PIVOT 8744 does not include a Battery, Charger or PSU. If these are required please add them to your order using the above drop down menu. The Spectralink PIVOT:SC 8744 expands the Spectralink 8000 Portfolio of Voice over Wi-Fi handsets to deliver enterprise-grade, on-site voice mobility with a user-friendly interface presented on an extensible application platform. 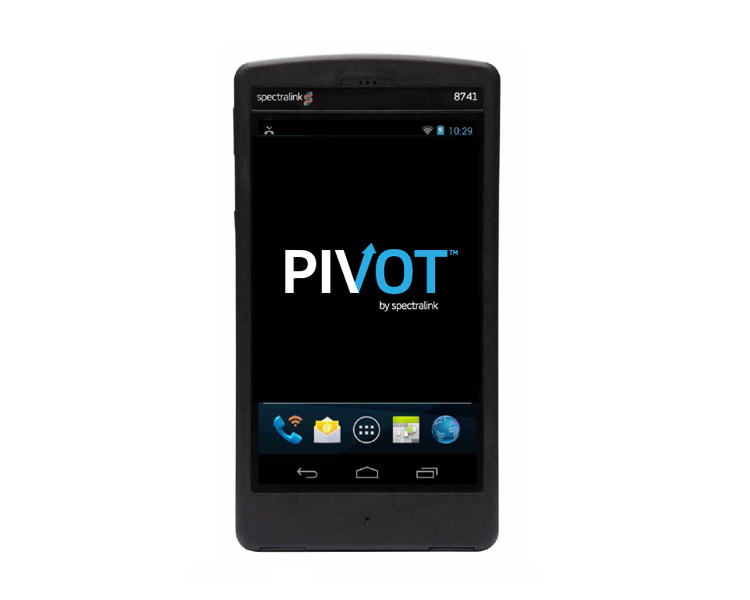 Based on the industry standard Android operating system, the PIVOT is a WorkSmart solution - differentiated by its intuitive touchscreen design, HD voice quality, seamless Voice over Wi-Fi roaming without dropouts, durability, broad telephony and WLAN interoperability, and predictable return on investment. PIVOT further enhances the customer value proposition with two enhanced standards-based application interfaces, an optional, high-performance integrated barcode scanner and an industrial-grade accelerometer. In partnership with the Spectralink applications development ecosystem, PIVOT enables new opportunities for end-user productivity solutions. VoIPon - your Spectralink PIVOT:SC 8744 EU Black Handset Only[PBK87445] distributor, supplier, reseller! Get all your wifi at VoIPon! If you would like to be notified when the"Spectralink PIVOT:SC 8744 EU Black Handset Only" is re-stocked, please enter your contact details and we will notify you instantly.